1 Latvia is de jure continuous with its declaration November 18, 1918. Latvia is a country in Northern Europe. The capital is Riga. It is one of the Baltic States, together with Estonia in the north and Lithuania in the south. Latvia's neighbours to the east are the countries Russia and Belarus. Latvia is split into four parts called Kurzeme, Vidzeme, Zemgale, and Latgale. People from Latvia are called Latvians. They speak the Latvian language, which is a little like the Lithuanian language, though not close enough to be understood. Latvia was settled by the Baltic tribes thousands of years ago. They mainly fished, hunted, and traded. German traders and crusaders came to Latvia at the end of the 12th century. Latvians lost control of their homeland. Over the next 800 years, Germans, Danes, Swedes, Poles, and Russians all invaded Latvia. Latvia finally became independent in 1918. The Soviet Union invaded Latvia during World War II and killed or took away many of its people to Siberia and other places far away from their homes. The Soviet Union then invaded again and occupied Latvia until 1991, when the Soviet Union fell apart and Latvia became an independent country again. In Copenhagen on 13 December 2002, Latvia and nine other countries were invited to join the European Union. On 20 September 2003, Latvians held an election to vote on joining. 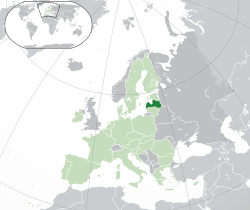 Two thirds of Latvians voted to join, and on 1 May 2004 Latvia became a member of the EU. Latvia has been a NATO member since 29 March, 2004. ↑ "Etniskais sastāvs un mazākumtautību kultūras identitātes veicināšana". Latvijas Republikas Ārlietu Ministrija. Archived from the original on 12 July 2011. Retrieved 2 December 2011. ↑ "Total population". Centrālās statistikas pārvaldes datu bāzes. 2011. Archived from the original on 26 May 2012. Retrieved 5 November 2011. ↑ 4.0 4.1 4.2 4.3 "Latvia". International Monetary Fund. Retrieved 2011-04-30. ↑ "Human Development Index Report 2011". United Nations. 2011. Retrieved 2 November 2011. Wikimedia Commons has media related to latvia. This page was last changed on 25 November 2018, at 19:23.